Sengs System means Sengottuvel System of Numerology. 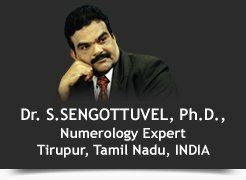 Dr.S.Sengottuvel is an eminent world legendary Astro -Numerologist. He specializes in empowering the “NAME” whether it is an individual name or company name by “Sengs Systems” of Numerology. Since the date of birth cannot be altered, name alteration is the one of the alternative to overwhelm hurdles in your life through numerology. He has his own deep learning and research in the field of astrology and micro numerology. He is proficient for its accuracy and dedication. He is well known all around the globe for his accurate predictions and to the point analysis of various facts of life viz. Education, Litigation, Property & Vehicle Purchase, Health, Travel, Career & Financial prospects, Marriage/Romance/Divorce, Children, and Longevity. All human being in this world wish to live healthy, But it is not possible for most of the peoples. Some peoples from their childhood, suffering by health problems, some people’s health problem starts in their “adult life” it is all depends upon their body resistance. But one thing is common, whoever is having a Negative Vibration Name they will have health problems. Negative name vibration makes negative biological change in their body and damage the biological mechanism. Let us see about the birth and fate numbers and its health problems based on “Sengs Systems” of Numerology. Every man is measured by his character or his behavior. Some are having good character, some are having bad character. Even in a single family out of three children one is having very good character and others two with bad character. These are all depends upon which date they born, according to the date of birth, every individual is having some specific character. Most of the parents are expecting good character from their children. But practically it is not possible. Some child become a famous person, some child become a scholar in education, some child become a scientist, some child become a saint, some child become a criminal, some child become a low character man and rejected by the society. All are depends upon the date of birth and Name Vibrations. In case of date of birth, we cannot alter it. But we can alter the Name of a man in to positive vibration Name, and then he or she will be shine like diamond. Name is everything if you understand the power of name, you can do miracle in this world. If one’s name is lucky as per “Sengs Systems” of Numerology then he will be having good relationship with family, relatives, friends, and society. If the name is unlucky as per “Sengs Systems” of Numerology he will be misunderstood by family members, relatives, friends, and society.